I love baking short breads! It's a wonderful, quick and easy way to produce a comforting, homemade loaf of delicious bread. There's no yeast, no rising time, and no kneading time (and the muscle to go along with it)! I am constantly trying new gluten-free creations to satisfy my eight year old son who has Celiac Disease. Truth is, when you get the flour combination right, there's no reason a gluten free cheddar bread shouldn't be every bit as yummy as a bread with wheat flour. Just ask my son! And let's face it, the creamy, melting cheddar in this gluten-free bread recipe is sort of like the icing on a cake! 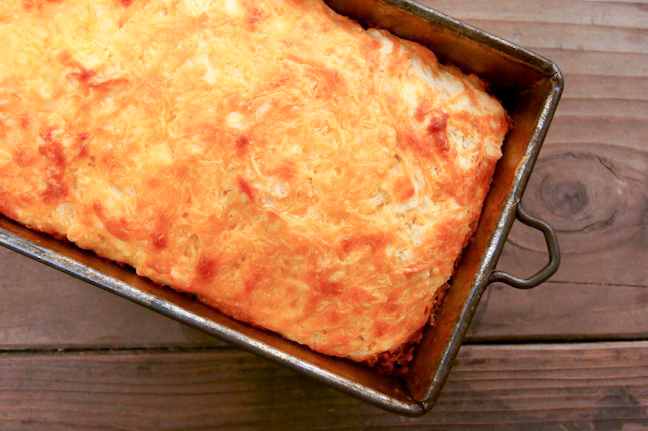 A gluten free cheddar bread is every bit as yummy as a bread with wheat flour. Just ask my son! Step 1: Preheat the oven to 350 degrees F, and coat an approximately 8-inch loaf pan with a thin layer of olive oil, and dust it lightly with brown rice flour. Step 2: In a large mixing bowl, combine the flours, xanthan gum, baking powder, baking soda, and salt. Make a well in the middle and set aside. Step 3: In a medium sized mixing bowl, gently whisk buttermilk, yogurt, egg, garlic, and olive oil. Fold in 2/3 cup of the cheese. Step 4: Pour this in the well in the dry ingredients and mix only until combined. Step 5: Pour the batter into the prepared pan and sprinkle the remaining 1/3 cup of cheese evenly on top. Step 6: Bake in the preheated oven until the bread becomes solid (it should no longer jiggle if you move the pan), the top is golden brown and slightly cracked, about 35 minutes. Step 7: Let the bread rest in the pan for at least 20 minutes or so. Then use a large plate or baking sheet to invert the bread to remove it from the pan. Then carefully turn it over, and wait about an hour before attempting to slice the bread. It should be completely cooled. Note: We love this bread sliced, toasted and with a bit of salted butter. Yum!